The Annex Wreck Room, located on Bathurst Street, is generally unassuming both from the outside and inside. After walking up the stairs, you suddenly enter a dark room with an illuminated stage. The spotlight is currently on 2 Live Drew, a dance group that is self-described as a “Grade eight graduation dance from 1989.” This description could not be more accurate. 2 Live Drew takes classic hip-hop and rap from the 90s and remixes it with various sounds and live guitar and drums. However, to see them before they begin to play is jarring in comparison to their performance. If anything, 2 Live Drew look more like the guys who would work in an IT department than DJs working with 90s rap. Easily one of the best moments of the set was when one of the members, who are both named Andrew, performed a spoken word of the classic “California Love” by Tupac Shakur. 2 Live Drew were a surprisingly good band and put on one of the most entertaining performances of the night. Next, in the same venue, was King Dylan. This prompted many questions such as, “Is there a guy named King Dylan?” and “Will he be wearing a crown?” Sadly he did not, but rather wore an oversized leather jacket to stand out from the crowd. King Dylan stood out from the entirety of the performances of the night but not in a positive manner. While the concept of a rap/rock band is still not completely common, it is tough to accomplish and King Dylan did not succeed. His rapping was strong and had excellent rhythm but the singing is where the king fell. His voice was pitchy and too over confident in his talent. Over at El Mocambo on Spadina Avenue, Halifax natives The Stogies brought the audience back to the days of classic rock with their unique sound. Heavy on bass and guitar, The Stogies made the ground shake and the audience loved it. Lead singer Blake Johnston was charismatic and knew how to work the growing crowd. It was entrancing to watch his giant afro move back and forth as he jumped around the stage looking like an Amish hippie. They sounded like a psychedelic funk band had an illegitimate love child with a heavy metal band: loud guitars, heavy bass but with very rhythmic singing and drums. The performance was standard: a bunch of guys rocking out to some great music. Upstairs at El Mocambo resembled more of a performance art piece rather than the set up for a concert. 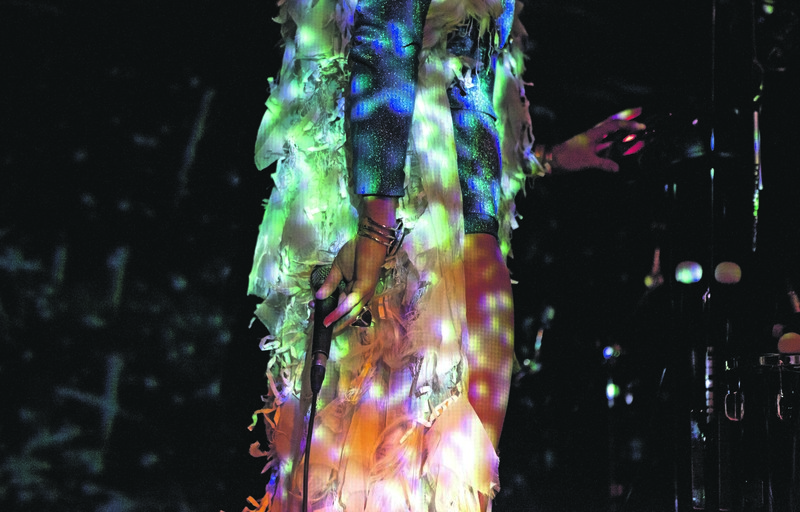 Following a trail of cut-out paper feathers up the stage lead the way to Australian band Ginger and the Ghost. The stage was easily the most visually stunning of all performances. They set the stage with textured rugs and sheets, a backdrop of fireworks and various garlands. It gave the impression that everyone was under water. Melissa Gilbert, lead singer of Ginger and the Ghost, looked otherworldy in her blue sequined jumpsuit and her white robe, which looked like she skinned Falkor the Luckdragon from The Neverending Story and sprinkled feathers and glitter throughout the performance. Her performance was full of watery reverb and a sense of etherealness. However, the reverb did not work in her favour. It got to the point where the audience could tell she had a lot of talent, but it was difficult to hear her voice under the reverb. Despite the reverb, the songs were extremely catchy and everyone enjoyed themselves. The last stop of the night was to Clinton Tavern to catch the tail end of their “Ode to Japan” night. Unsure of what to expect, it was assumed that it would be featuring J-Rock bands. Four Minutes to Midnight, sadly, was not the J-Rock band of our dreams. To add on top of this crushing blow, Four Minutes to Midnight fell a little short. Eli Taylor, the lead singer, pantomimed throughout his performance which distracted from his average singing. The energy and chemistry between the band was intense and could be felt through the audience.